Do you need a concrete sawing contractor? Sometimes it feels difficult to justify adding another specialist to your crew or even contracting it out and having yet another body on the job site. You have enough workers, and you may even have some concrete cutting tools that you own or can easily rent or borrow. Do you need a concrete sawing contractor? The answer may be a no, but it also may be a resounding yes, depending on the type of concrete sawing job that you’re doing. Before you decide, really consider the following issues. They may be the reasons why you do need to contract with a specialist. You may have access to lots of the tools needed for concrete cutting – maybe you own them, or you have a source that will allow you to borrow or rent them – but can you get everything that you need? If you need heavy-duty saws for this job, you are likely going to need to purchase something, whether it be special diamond blades, specialized bits, or something else. A concrete specialist will know what tools the particular job that you’re doing needs, so no one spends time and money buying the wrong thing. Speaking of time, is it worth it for you to spend time renting or borrowing the equipment, and probably learning how to use it, over hiring a contractor? Don’t forget that your time has a monetary value as well. 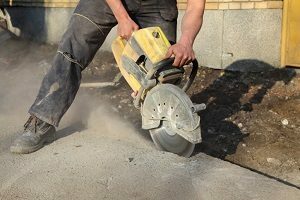 Concrete cutting often needs to be done very precisely – when holes need to be precisely the right size or the surface needs to be clean and professional looking when the job is done – and this is usually not achieved on the first try. Your concrete cutting specialist has years of experience to help them handle even the most precise cutting task. How much extra time and resources will you waste if you don’t get this cut right on the first try? Call in the contractor, so you don’t have to find out. Sometimes concrete work presents unique challenges, such as drilling holes at odd angles or sawing in tight conditions. This can be anxiety producing, even when you’re not putting that on top of doing a task that is new to you or one that you don’t do often. Your concrete contractor does this type of complex work all the time. They will be able to handle the added stresses of the task. This entry was posted on Monday, March 25th, 2019	at 10:54 am	. Both comments and pings are currently closed.